What’s your stance on ginger? If you’re not a fan, you’ll certainly want to avoid these Indonesian treats. But how about the rest of us, the ginger-neutral or the devotees? What should we make of these penny-sized candies, suffused with the famous root? My suggestion is that we make a hoopla, jump through it, and celebrate Gin Gins Boost! These candies are pretty darn good, even though I’m not usually pro root-candy. But something about the picture on the bag got me interested. I mean, how often do you see a ginger-root man in a suit, flying through the air, carrying a suitcase with tubers for hands? Exactly. And now for the candy itself. Each piece looks like a brown lozenge, and comes individually wrapped. At first, it seems these are hard candies with a boring flavor, but the candy quickly softens a bit until you can chew it, and the ginger really kicks in. But so does the sweetness, which very much helps cut the spice’s edge. Another pleasing sensation is the mild heat the ginger seems to generate in your mouth. Overall, Gin Gins Boost is a unique candy experience: spicy, warm, yet somewhat mild and chewy sweet. I like it! And if you’re a ginger fan or just curious, I recommend Gin Gins Boost to you, too. I got mine at World Market; they’re also available online. I haven’t tried these, but their ginger chews are great – the only spicy candy I like. 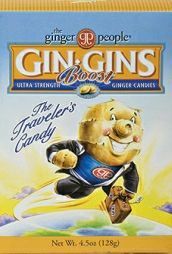 I really like the GinGins Boost, not as much as the regular ones. But I usually go for these to ease motion sickness (out on whale watching boats). Definitely not for the faint of heart – after a half a dozen, it definitely burns. These candies have disturbing packaging. They always show some cannibal ginger getting fat off the delicious flesh of his brethren. In this case, however, it looks like the cannibal is in some sort of hurry, and therefore must consume his own kind in convenient travel form.